Like all great inventions, The Sill was born out of necessity, passion, and a window of opportunity. 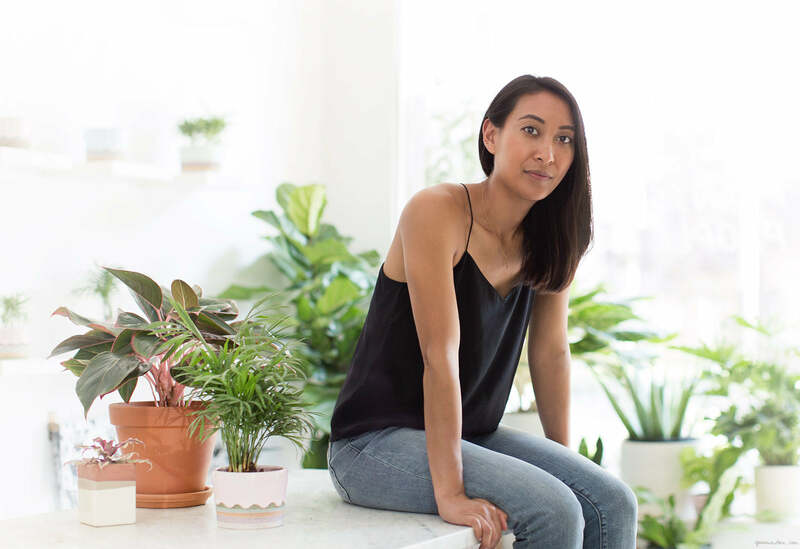 A fan of plants but not the market they existed in, Eliza Blank and a few other plant-savvy individuals came together to create a user-friendly experience for the modern green thumb. The goal was simple: to inspire people to bring more plants into their home. The result? A practical, colorful, and totally attainable brand that brings the idea of the houseplant back to its roots. We stopped by the Lower East Side store front to talk with Eliza, get our hands a little dirty, and learn about which plant to chose for any and every occasion. Can you tell us a little about what The Sill does? The Sill aims to put a plant on every windowsill. We have an online shop that ships nationally, a storefront in the Lower East Side of New York City, and we offer plant design and maintenance services to companies – think offices, retail spaces, restaurants – here in NYC and in LA. How was the idea of The Sill conceived? I always loved plants but thought they were difficult – a story we hear often from many of our customers. I had a lot of misconceptions about houseplants and how to care for them. I wanted to start a brand that offered a real solution to incorporating plants into our lives. As it turned out, so did a few other fine folks. I synced up with business partner Andrew Erdle, and The Sill’s head of marketing, Erin Marino, and The Sill was born. I really want to incorporate plants into my apartment. What is the best starting point? How do you successfully pot a plant? Can’t say I’ve ever succeeded in that department. Potting, and re-potting, your plant is easier than you think! We recommend choosing a planter that is no more than 2″ larger than the plant’s plastic grow pot (for tabletop plants). A plant should never be swimming in soil in an over-sized pot – which tends to lend itself to overwatering and eventually root rot. Look for well-draining soil that’s meant for indoor container gardening; pick a sturdy planter with a drainage hole and saucer (or create your own makeshift drainage by lining the bottom of your planter with rocks to create crevices); and keep a newly potted plant out of harsh direct light as it acclimates to its new home. And it’s a common misconception that repotting a plant means simply replacing it’s planter. Instead, the big benefit of repotting is fresh new potting soil, which provides your plant with new nutrients. Plants typically need to be repotted every 18 months. What’s the biggest misconception people have about owning and caring for plants? That they’re difficult! Most people actually kill their plants by attending to them too frequently. We see a lot of well-intentioned overwatering. A lot of plants really like to be neglected! 3. I want my shower to resemble a jungle: Ferns! Love this post for making plant care sound easy and accessible (which it is, indeed)! I love plants. I have my windowsills full! I would recommend basil, too. Pretty and you can use it in the kitchen. Pretty easy to care for, too. Chouette article, c’est dommage qu’elle ne soit pas présente en Europe! Mais je retiens bien ce qu’elle dit… Il est encore temps de révéler mon ‘pouce vert’! J’adore les plantes mais je n’ai pas du tout la main verte. J’oublie de les arroser, elles finissent par être mal en point… Je me suis donc mise aux cactus (ça ne demande pas beaucoup de soin) je ne l’ai pas arrosée en deux mois et je ne sais pas pourquoi elle a aussi fini par me lâcher elle aussi! Je laisse tomber!!! Très désolé d’entendre parler de votre cactus. Cacti besoin d’être arrosée une fois toutes les 3 semaines, mais si en plein soleil, une fois par semaine. Nous espérons que nous vous avons donné des idées pour essayer à nouveau! I have a bug phobia and am always afraid plants will bring in bugs! What should I get? Also, are succulents the same as cactus? Hello! Occasionally, little bugs called fungus gnats do live in the soil. However, they can be easily dealt with via an application of diatomaceous earth. Also, if you’re still afraid, then go soil-less and get airplants. Airplants don’t need soil. No soil, no bugs. J’en ai toujours eu partout ou j’ai habite, jusqu’a mon emmenagement en Floride, maintenant les plantes luxuriantes sont a l’exterieur et entourent ma maison, je les vois de toutes les fenetres. Wowww the pots look so lovely. This inspires me to start planting my indoor mini jungle right away!!! And thank you for sharing the tips! This sounds like the So perfect location every Merci Nathalie! Vive les plantes :) ! Lovely story and photos! Really digging the approach of The Sill! I have sort of a green thumb nowadays through trial and error and recognize a lot in this article – took me a while to understand how to not overwater! Which I try to tell my friends, but they usually don’t believe me, haha. I should forward them this article. What I can also recommend to people is to grow their own plant from seed. I recently sprouted and then planted white acacia seeds and it has been amazing to see them pop up and grow and branch out! It might be a daunting idea, but there’s actually not much to it and watching it grow feels like the plant is a pet almost! I also sprouted a couple of extra seeds of the acacia to give to friends and boyfriend (whose gonna make a bonsai of it), which I felt was such a personal and cool gift (in a nice pot of course). Love this! I grew up in a home that had lots of plants, as do I now. My meditation room is full of them. I really enjoy taking care of them. This is a beautiful piece I just wish they shipped to Canada.